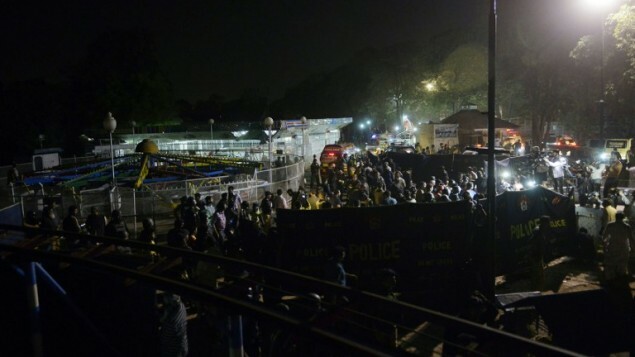 ISLAMABAD, Pakistan – (AFP) – At least 65 people were killed and more than 200 injured when an apparent suicide bomb ripped through the parking lot of a crowded park in the Pakistani city of Lahore where Christians were celebrating Easter Sunday, officials said. Dozens of ambulances were seen racing to the Gulshan-i-Iqbal park, situated near the center of the city of around eight million, with many women and children among the dead and wounded. Lahore top administration official Muhammad Usman said the toll had reached 65 people. “The rescue operation is continuing,” he told AFP, adding that more than 50 children were among the injured. The army had been called in, he said, and soldiers were at the scene helping with rescue operations and security. Senior police official Haider Ashraf said the blast appeared to be a suicide attack, adding that ball bearings were found at the park. A medical superintendent at Jinnah Hospital, who gave his name only as Dr. Ashraf, told AFP the number of injured stands at more than 200 people, most of them are in critical. “I fear the death toll will rise,” he added. Provincial health adviser Khawaja Salman Rafique told AFP meanwhile that authorities were asking citizens to donate blood. Javed Ali, a 35-year-old resident who lives opposite park, said the force of the blast had shattered his home’s windows. “Everything was shaking, there were cries and dust everywhere. Pakistan has been battling a homegrown Islamist insurgency since 2004, with groups such as the Pakistani Taliban routinely carrying out attacks as part of their struggle to overthrow the government. But Lahore, Pakistan’s cultural capital on the country’s eastern border with India, has been relatively more peaceful in recent years. On social media Pakistanis were retweeting the call for blood donations, while Facebook activated its “Safety Check” for Lahore. Sunday’s blast came as the army was also deployed on the streets of the capital Islamabad after thousands of protesters clashed with police in chaotic scenes, throwing stones and setting a container on fire. The demonstrators were supporters of Islamist assassin Mumtaz Qadri, who was hanged on February 29 for killing a Punjab governor over his call for blasphemy reform. Analysts called the execution a “key moment” in Pakistan’s long battle against religious extremism. But it has also exposed deep religious divisions in the conservative Muslim country of 200 million. Earlier Sunday an estimated 25,000 supporters of the former police bodyguard gathered in Islamabad’s twin city Rawalpindi to offer prayers. They then turned toward the heavily-barricaded capital, which was patrolled by hundreds of police and paramilitary soldiers. Riot police carrying batons and shields fired tear gas to try to prevent them pushing closer to the city center. Some protesters set fire to a container while chanting slogans. A military spokesman said late Sunday evening that the army had been deployed to secure the Red Zone around Parliament. Nationwide, overall levels of militant violence have fallen since the army began a major offensive against Taliban and Al-Qaeda strongholds in the country’s northwest border areas in 2014. Last year saw the lowest number of civilian and security forces casualties since 2007, the year the umbrella Pakistani Taliban group was formed. But militants are still able to carry out major attacks from time to time. At least 16 people were killed and more than two dozen wounded when a bomb blew up inside a bus in Peshawar, the main city of Pakistan’s insurgency-wracked northwest on March 16. And Sunday’s blast in Lahore saw the highest number of casualties since a suicide bomber blew himself up, killing 55 people at the main Pakistan-India border crossing at Wagah in an attack claimed by the Jamat-ul-Ahrar faction of the Taliban. It is time to stop turning the other cheek and deal with them like the Tamil Tigers.